Hello guys I'm back the busy days are over and my laptop is healthy again woot~woot :) I miss you all and I miss this blog grabe. Oops by the way HAPPY ANNIVERSARY Food Trip Friday!! Here is my food for today!!! Sarap! !Welcome back sis and I hope you are enjyoing the Spring. Hi Jac, thanks for visiting My FTF #17 and an FTF 1st Anniversary Greeting ... :) By the way, I love your handa.. wow.. sarap nmn nyan.. yum yum..
Sarap nito for sure, even if I don't eat Asparagus, but bec of the bacon, I will surely enjoy it. Ang sarap ng bacon wrapped with asparagus mo,Mommy Jac! 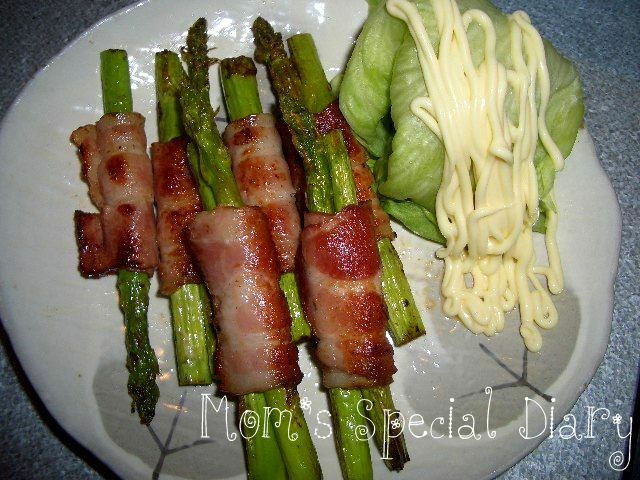 !My kids loves that on their bento!You may add teriyaki sauce for a change.Yummy! I love this recipe, and it's easy to prepare!